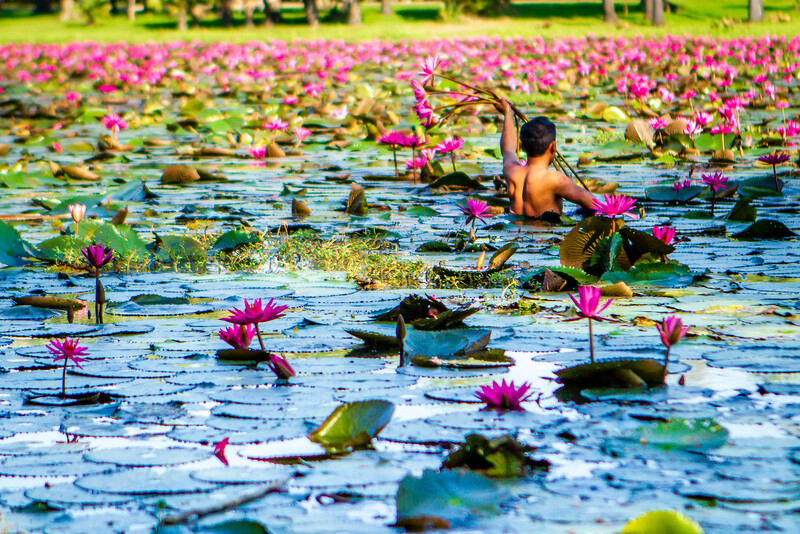 The Cambodia flower, the lotus flower is one of the most plentiful flowers in Cambodia. Everywhere you travel in SE Asia you will find them in lakes, ponds, canals and even in roadside ditches. The flower is not only beautiful, the lotus flower has symbolic meaning in Hindu and Buddhist traditions. Because it roots in muddy water, then rises and blooms above the murk, the lotus flower symbolizes enlightenment. Lotus seeds can be eaten (quite delicious actually) and there is medicinal value in the roots, stamen and pedals. I came across this man harvesting purple lotus flowers while I was out adventuring in one of the more remote areas around Angkor Wat. It was a very hot day and I was tempted to jump in the water and help. I made this image with my Canon EOS 7D 18 MP DSLR Camera (origional model) with a Canon 24-70mm f/2.8L EF L-Series Standard Zoom Lens USM from about 40 meters away.